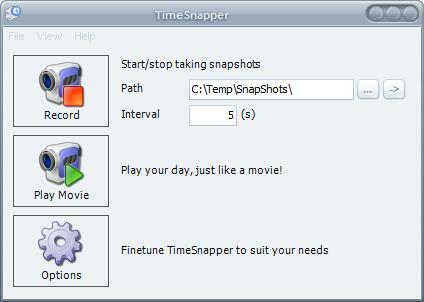 Time Snapper is a unique application that can be used to create an automatic screenshot journal. The software automatically creates screenshots of the user's desktop or the active application window and saves them in a selected directory. By default a new screenshot is created every 5 seconds in png format that is covering the whole screen. The taking of new screenshots can be started and stopped in the application and it is definitely a good idea to pause while entering user data or other personal data. The user can select several different formats for the screenshots and play the "movies" on a day by day basis. The program can be configured to delete images that are older than a selected number of days. I can see some uses for this, for example to create a production diary when working in applications like Photoshop or a video editing application. The pro version comes with several handy features like excluding certain applications from the process. Actually, a potential use for something like this would be to capture an application that is having problems, so you might get a clue as to why the problem is happening. Another potential use for this would be to see how you’re using your time online in a visual format. another use would be to transform your boss in Big Brother. I should send the idea to Scott Adams. >another use would be to transform your boss in Big Brother. There are actually a number of software programs available that will secretly take screen shots on a regular basis. Some are for the corporate world and others are for parents monitoring kids (or husband’s/wives, boyfriend/girlfriend monitoring each other). On the personal side, I believe there have been some court cases where doing this without consent of the other adult party was ruled an invasion of privacy and subject to criminal penalties.